Donations will be automatically deducted at 6:00am on September 20. Let your friends and family know that you support Helping Restore Ability with a FUNdraiser. After you create a donor profile, you will have the option of creating a FUNdraiser on the Helping Restore Ability page. Set a goal and share with your social networks, friends, and family. This peer to peer giving page allows your family and friends to support Helping Restore Ability as well. The FUNdraiser with the highest total donation amount will win a prize basket. Winner will be announced by CEO, Vicki Niedermayer, on September 21 on Facebook Live. Dollar-for-dollar matching funds are a great way to inspire others to give and to help HRA reach our goal on North Texas Giving Day. Would you be interested in supporting our mission this year by providing a matching fund that we could promote and leverage on North Texas Giving Day? Do you know a company that would be willing to support HRA in this way? Last year, 54% of donors reported that North Texas Giving Day inspired them to give more. Your help with a matching fund will encourage donors to rise to the challenge on September 20. Speak with your workplace about hosting a “pay-to-play” donation event. 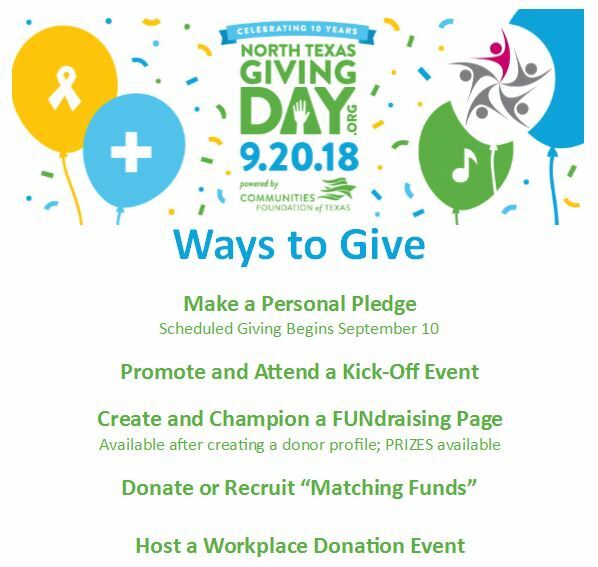 A final dollar amount should be available by 4 pm on September 20 to be included in the North Texas Giving Day totals, but a check may be mailed after September 20 if needed. For more information or detailed instructions on any of the Ways to Give,download the brochure or email lpatrick@hratexas.org.